Since 2003, we have lived continuously with rats. We loved them so much that we began researching healthy diets, local vets, appropriate cages, and more until we found what works best for our rats. These amazing animals have become our biggest passion and our lives revolve around them. This led us to delve into rat genetics so we can better understand rat markings, color standards, and health. We decided we wanted to contribute to the bettering of the species and began to breed. We've learned a lot along the way and have enjoyed every second of it. We couldn't imagine ever living without them. 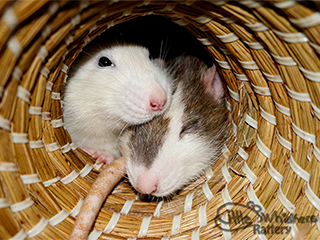 My husband and I started breeding pet rats in early 2010. Our goal is to provide people with healthy pets that are loving and people-friendly. We want to further the breed and educate the public on the amazing pet rat. We always work with adopters if they have any questions or issues. We want to know about any health problems that develop that may hinder future lines, and encourage open communication with past adopters. We carefully track the genetic heritage of our rats so we can continue to make wise breeding choices. Well-bred animals live longer, healthier, happier lives and have friendlier personalities that make them excellent companions. We want to produce rats that are not only easy to handle, but a joy to befriend. We are a small scale rattery that has around 6-8 litters a year. We keep a wait list for adoptions and only approved adopters are added to the list. We want our rats to enjoy their lives. All of our rats are kept as pets and live in spacious Double Critter Nation cages. We do not use bins or tanks as enclosures, and all babies are treated as though we are keeping them for ourselves. They spend time with us several times daily and have a "ratty playground" that they spend hours playing (and napping) in. We ONLY adopt our rats out as pets! 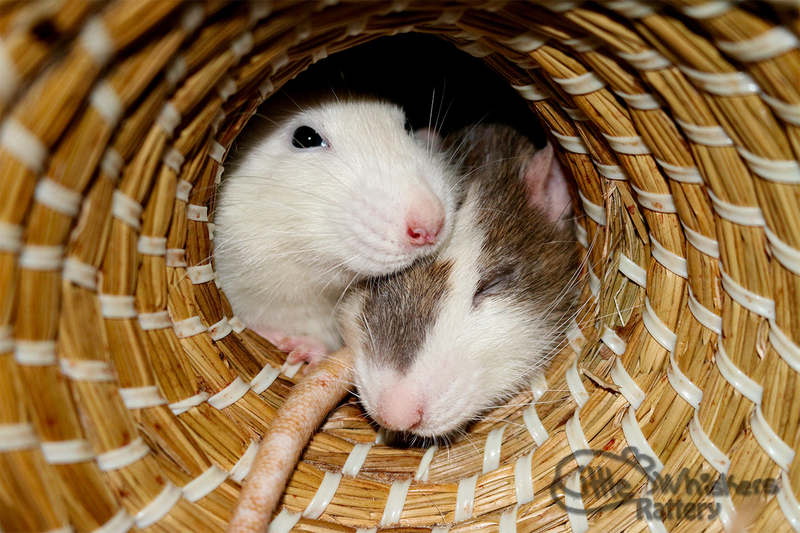 Our babies deserve the best rat-loving homes, so we screen adopters and educate as needed. We also treat our rats humanely, which includes having an excellent vet on hand for emergencies. Their health is very important to us. Last but not least, we never breed more rats than we are willing to keep and care for. Our first and favorite line <3 We have had many lovely dalmatians from these litters and they are by far our favorite. Not that we don't adore our variegated babies, who are so unique and beautiful. Our lovely sister ratteries are also helping us bring in some downunder and roan rats to this line, which will eventually be available to adopters. We are excited to have the famous PNW roans in our rattery! We are always excited to see how the markings turn out in these litters. Right now our marked line includes velveteen coats, rex coats, and dumbo ears. We are currently working to improve the health and longevity of this line. They already have great personality and their type isn't bad. Their health isn't bad either, but it can always get better! We have a lot of color variety in this line, which we just love. Our focus has been on Russian blue, agouti, black, and some red eye dilute colors such as beige. We haven't really focused on show quality with this line, but are always working towards better type and markings. We have always had some c-locus (Siamese/Himalayan) in our line, but didn't work on it in earnest until early 2016. Our main desire is to produce Goldens, and we were given the opportunity by Shangri La Rattery. She provided us with some Golden Martens and lovely Siamese babies to help start us off. We are very thankful for the rats we received. Unfortunately, we never received a pedigree for the rats we were given, so we had no idea what their genetics were like. That makes things tough when working with a rare variety like Goldens. They require a number of dilutes to be the correct color. We both have worked hard on mapping their genotypes and proving that the genetics work. During this process we decided to split the Martens from the Goldens so we can improve both varieties. At the 2017 Fall Rat Show in Port Orchard, WA, we successfully standardized Goldens and Martens within the RatsPacNW Rat Fancier Club. We are so proud to have come this far and look forward to the future of these lovely varieties. We hope to see constant improvement in their already fantastic temperament, health, type, and color. We hope everyone who adopts from us will be happy with their babies. We want our adopters to experience the same joy we do! Note: We use Breeder's Assistant software to keep track of our genetics. If you have any questions, please shoot us an e-mail!